William Howard reviews Stephen Laughton’s “artful, honest and deeply romantic” story of first love for a gay Jewish teenager. Tom Ross-Williams in Run at Vaults Festival 2016. The key difference between theatre and performance art is distance, the metaphor being that if one cut someone performing in a play the blood would be fake, and if one cut a performance artist, the blood would be real. However, that’s not to say there isn’t a grey area, where a performance artist plays a role to perfection, or, in the case of writer Stephen Laughton’s new play Run, where a performance comes so entirely from the heart that an audience isn’t entirely sure where the performance ends and the person begins. Run is a solo show telling the story of Yonni, a Jewish teenager surrounded by a dysfunctional family and haunted by the memories of Adam, his first love. 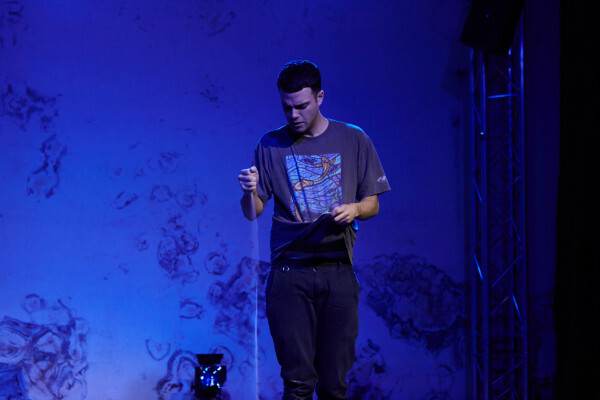 As with any solo show, whether the piece works or not is almost entirely dependent on the skills of its actor, and in Tom Ross-Williams, Laughton and director Oli Rose have found a captivating, effortlessly expressive lead that reveals Run to be a quietly extraordinary piece of work. Ross-Williams is able to embody every aspect of Yonni’s character in a posture, nailing both his big-man-in-town swagger on the last day of secondary school and his nervous, lovestruck fidgeting when he first realizes just how much Adam means to him. He also shines by physicalizing his character’s barely suppressed frustration with his family, who are hanging together by a thread in the lead-up to Shabbat. The staging of the piece, or lack thereof, also places the majority of the audience’s focus on Ross-Williams. With a completely barren stage save for some handfuls of sand scattered across it at certain points of the show, Ross-Williams never lets the audience’s attention wander away from him for a moment, with his impressive ability at physical theatre and dance complimenting his naturalistic character work as Yonni. However, the production’s skill is also in its subtlety. Music composed for the piece by Helen Sartory provides the perfect accompaniment when Yonni’s story drifts into flights of surreal fantasy, while the lighting anchors everything in a similar fashion, plainly lighting up the stage when Yonni speaks about his present situation, before expertly setting the mood for his reminisces of time spent with Adam. Run is a piece that is acutely aware of its limitations and ambitions. There’s nothing about it that reaches too far from its grasp, and while this does mean the piece slips into something of a comfort zone on one or two occasions midway through, it also means that when it does raise the stakes and heighten the tension dramatically during the third act, it does so with a confidence that makes the last ten minutes hit the audience like a punch to the gut. It’s also a piece that’s proudly emotional and wears its heart on its sleeve, and while the admitted schmaltziness of a few of Yonni’s early soliloquies about falling for Adam might turn some off, it actually leads to one of the most inspired character beats of the whole piece. The protagonist is 17 and in love for the very first time, of course he rhapsodises awkwardly about his boyfriend – we all did the first time we found someone! In all, Run speaks to some of our most intimate and precious shared experiences. As a play written by a gay, Jewish man about a gay, Jewish teenage boy who is portrayed by a gay, Jewish man, one might understandably assume that it’s specificity might be its downfall. However, Run speaks eloquently, affectingly and at times agonizingly about love and loss in a way that everyone can relate to, and then looks at those feelings through a prism that gives it a life outside of what most of the audience can personally relate to. Run was on as part of Vaults festival. Click here for more of their programme.